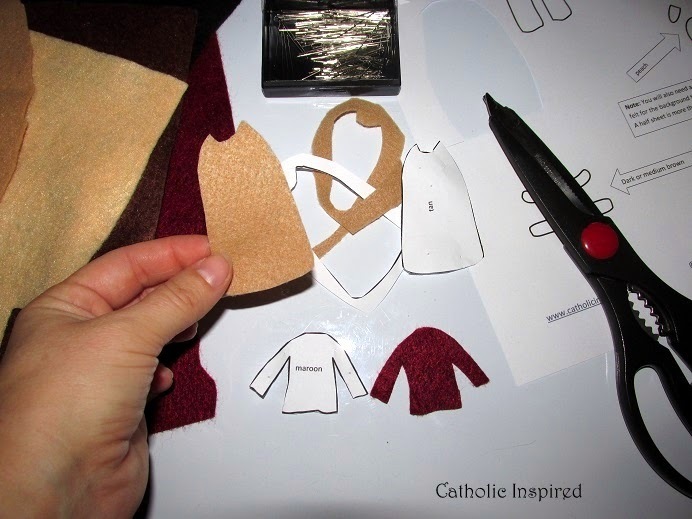 Hi everyone, This post is a "test" to see what all of you want and are desiring -- Back in July Elizabeth and I started creating these Liturgical ornaments and sharing our creations with you so you, too, could make them if you wanted. Well, I've gotten a number of people asking if I have patterns for the ornaments. I'm sorry to say: no, I don't. We free-hand all of our parts and I just take a picture of them before we glue them together. But I thought long and hard about the requests for patterns, and after a long discussion with my husband, I thought I'd run a test post on this topic to see if this idea is worth the time it will take to create. Please understand that it will take time to create patterns for the ornaments and sadly I don't have a lot to free time. Homeschooling 9 kids is a full-time job as many of you know! But I want to help all of you if I can, so I'm offering a set of patterns to download, but I'm planning to charge a small fee for the patterns because if I take the time to create them I'll need to order out for dinner, pay a babysitter, etc. I hope you all understand. 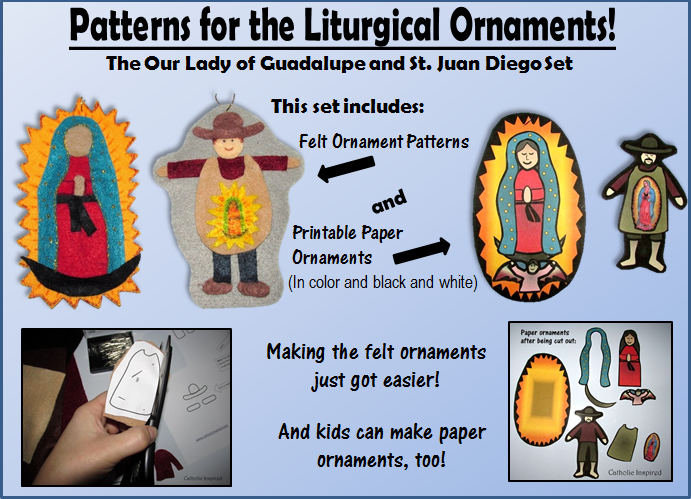 Today's "test" set is Our Lady of Guadalupe and St. Juan Diego. 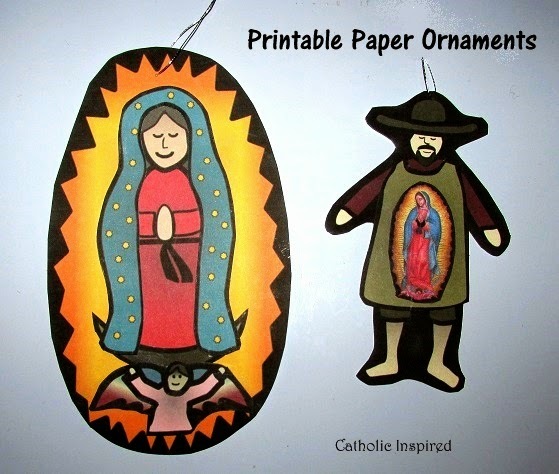 The set includes patterns to create a felt ornament for each. It also has the instructions on how to assemble the felt ornaments. 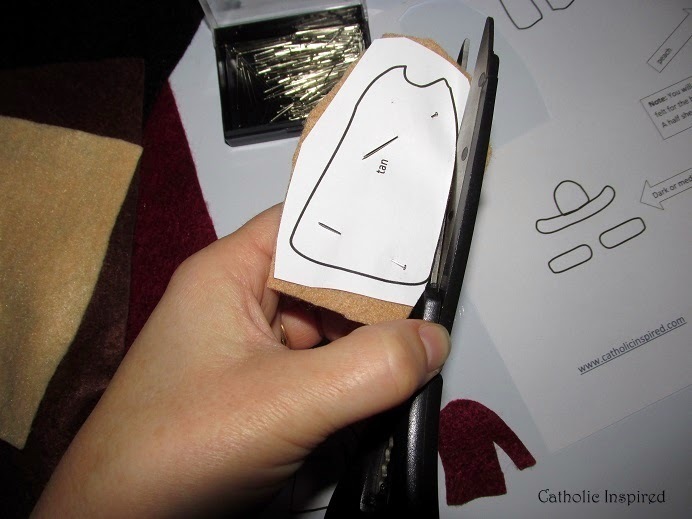 Just cut out the pattern, pin it onto the correct color felt and cut them out! That's nice and easy for you! I actually discovered that cutting the felt along with the paper was easier than cutting the felt alone! So don't worry that this will be hard to do. I'm amazed at how easy this makes the production of these ornaments! This printable set also includes 4 printable paper ornaments. I didn't originally plan to add these, but after I made the patterns for the felt ornaments I basically had them half finished. So I just decided to go ahead and create them for those who don't want to mess with the felt. Choose the set in full color or the black and white set, which the kids can paint or color. 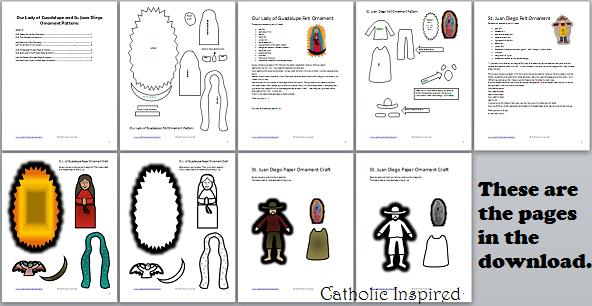 You are free to make as many copies as you need for your class or family. Because this is a "test" post, I'd really like to have your thoughts on this. Please leave a comment or send me an email. If you are not interested in the felt patterns and only want the printable ornaments, (or vice-versa) please let me know your thoughts. Your purchase supports this idea and if enough people seem interested I will continue to make the sets. Thank you so much for your input, everyone!! I've gotten some very good responses via email, as well. I'll make a few more sets to see if the interest continues. Thanks again! God Bless.